What is Imperialism, and How Did It Get to the Philippines? Imperialism is the highest stage of capitalism, the state of monopoly capitalism. Simply put, it is comparable to a leech, whose only means of living is by feeding off of its host. In reality, Imperialism, due to its crisis of overproduction, needs to depend on the sustenance of feudal and/ or semi-feudal countries such as the Philippines. At the dawn of the 20th century, the United States has reached the highest stage of capitalism, wherein capital, banking and industry merged and reached a point of monopoly. Due to this combination, it has dramatically raised its productive capacities, enabling it to produce more than enough commodities needed for domestic consumption. As a by product, the crisis of overproduction came knocking on its doors. This condition necessitated the United States to look for new markets, sources of cheap raw materials and surplus capital, and a cheap labor force beyond its borders. In 1898, the Philippines was on the verge of a revolutionary victory against the crumbling Spanish empire. 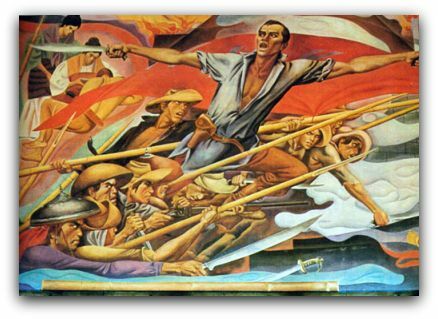 Led by the proletarian hero Andres Bonifacio, the Filipinos launched the first war of national liberation in Asia. Through the Katipunan, an underground revolutionary movement, the young Filipino proletariat, in alliance with the farmers and intellectuals mobilized the Filipino masses to realize their national and democratic aspirations. After buying the Philippines from Spain for twenty million dollars, the U.S. proceeded with its Imperialist conquest, which they called “benevolent assimilation”. It immediately showed this so-called benevolence by replicating its genocidal campaign against the Native Americans, this time against the Filipino people. Employing a hundred thousand troops and the most advanced military weaponry available, they murdered an estimated six hundred thousand Filipinos, combatants and non-combatants alike, in coldblood. On July 4, 1902, the U.S. government declared the war over but Filipino revolutionaries, alongside the masses of workers and peasants, continued the struggle for national liberation and democracy. How Does U.S. Imperialism Operate in the Philippines? Figuratively speaking, the semi-feudal and semi-colonial character of Philippine society is the fertile soil from which imperialism draws its life. The nation’s economy functions on an export-oriented, import-dependent approach that is forced to crouch down to the demands of U.S. Imperialist interest instead of responding to domestic needs. Despite being an agricultural country, the grasp of feudal practices such as monopolization of land, exploitative working conditions for farmworkers, backward agricultural technology, and production aimed for export resulting in massive landlessness among the peasantry and the proletariat (which compose 90% of the population), joblessness, rising prices of basic (imported) commodities, and migration among the workers and the petty-bourgeoisie (4,500 Filipinos leave the country per day). Imperialism boasts of its ability to control a state without physical presence; thus, it furthers its influence through economic, political and cultural means. Long after the supposed use of military might in the name of democracy in the Philippines, the U.S. introduced and established the bastion for colonial mentality- the public school system. Its curriculum suppressed nationalism by diluting the rich, revolutionary history of the Filipino people, imposing the use of English as the medium of instruction, and promoting Western culture. 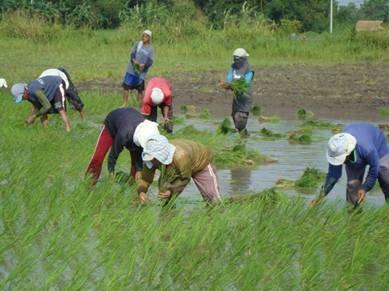 -Sham Agrarian reform programs, which ironically serve to concentrate agricultural lands in the hands of the Landlords and maintain the backward agriculture that is solely geared towards producing crops for export. 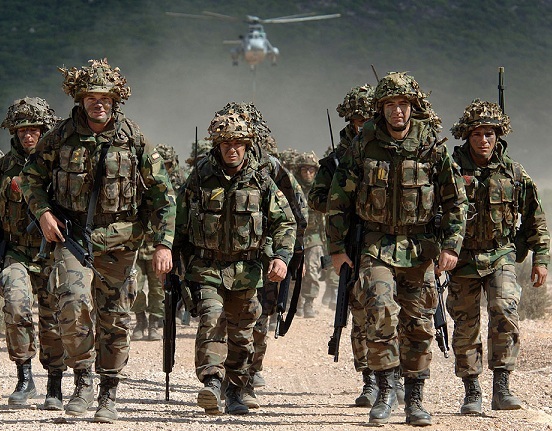 -Counter-insurgency programs that are fully funded by the U.S. These aim to destroy the armed revolutionary movement in the Philippines, namely the Communist Party of the Philippines, New People’s Army and the National Democratic Front of the Philippines (CPP-NPA-NDFP). 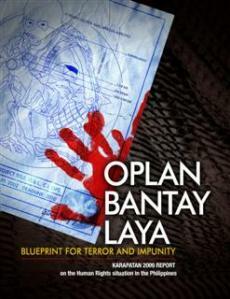 The latest among Counter-insurgency program is called Oplan Bayanihan, the implementation of the U.S. Counter Insurgency (COIN) Guide, the primary cause of human rights violations in the Philippines. -one-sided Economic agreements, neo-liberal policies such as trade liberalization which opens up the economy to surplus goods and capital being dumped by the U.S., economic deregulation that produces super profits, partularly to Oil Cartels, privatization of basic social services and contractualization of labor to provide cheap labor for foreign monopoly capitalists. Today, the colonial foundation of Philippine education manifests itself through the prevalence of privatized and semi-privatized schools determined to produce English-speaking teachers, nurses, engineers and other professionals to satisfy the needs of the global workforce, while industries shrivel and deteriorate at home. Hand in hand with the Labor Export Policy, a government initiative to generate funds to keep the economy alive through billions of dollars in remittances each year, the semi-colonial character of Philippine society stunts the nation’s growth and impedes its path to national industrialization. 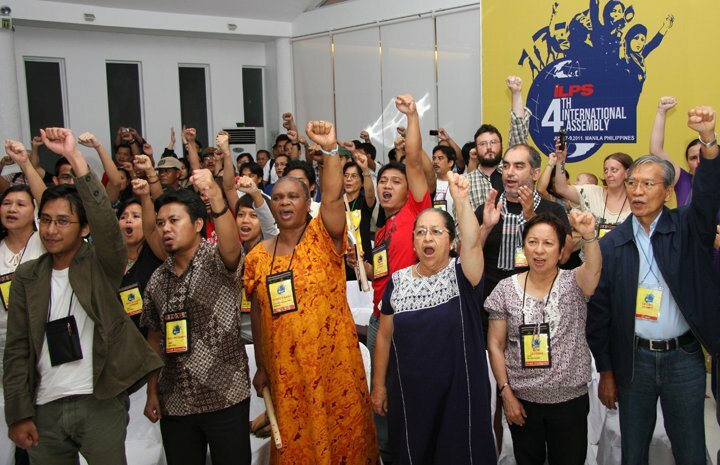 What Are the Filipinos Doing to Fight Imperialism? Filipinos are generally described as happy and peace-loving people. They are known to be a nation of hospitable indigents, of hardworking service-oriented men and women. This is essentially true. They believe in social justice as a stepping stone for peace, and they work hard- -some even risk their lives– in advancing the struggle for genuine democracy. Anti-imperialist movements come in various forms. The first and longest running of which is the New Democratic Revolution being waged by the New People’s Army (NPA), under the leadership of the Communist Party of the Philippines (CPP) and its revolutionary united front, the National Democratic Front of the Philippines (NDFP). Last 2009, the CPP declared that it will aim to achieve, what it calls, the Strategic Stalemate of its protracted people’s war in 5 years. This worries U.S. Imperialism as the revolutionary forces threaten to crush its local reactionary puppets. 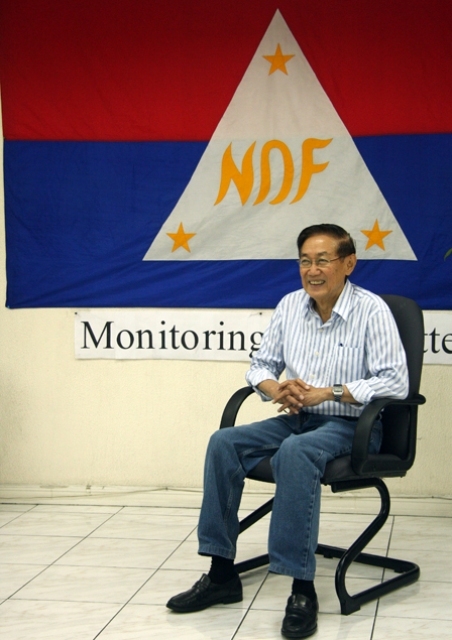 The second, in which Anakbayan (in English: “sons and daughters of the nation”) is part of, is the legal National Democratic mass movement across the country and abroad. Its aim is to fight for the basic rights of the Filipino in recognition of the fact that the country is controlled by a foreign entity, and will remain poor until it liberates itself from U.S. Imperialism. National Democracy involves the advancement of a mass-oriented, scientific and patriotic culture by providing free, accessible and liberating education to all levels; upholding worker’s rights, raising the quality of life, and developing social services by way of genuine agrarian reform and strategic national industrialization; and adapting an independent foreign policy that is anti-imperialist, independent and peaceful. Its analysis of pressing issues such as budget cuts in education and other social services, oil price and fare hikes, U.S. wars, and human rights violations incorporates the relation of imperialism, bureaucrat capitalism and feudalism as the three basic problems in Philippine society. Finally, the International League of Peoples’ Struggle (ILPS) forms the united front for anti-imperialist and democratic struggles of workers, peasants, women, youth, professionals and other sectors of society around the world. The ILPS- USA chapter will hold its founding assembly on the third week of May 2012 in Seattle. Visit www.ilps-web.com for updates. 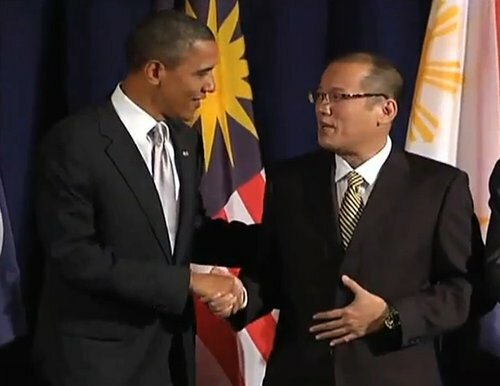 The current U.S. puppet, Benigno “Noynoy” Aquino III, is squandering the Filipino people’s money on senseless foreign debt servicing and fortification of the Armed Forces of the Philippines (AFP) in its U.S.-backed war against the armed resistance in the countryside without addressing the root cause of the conflict. His government, with assistance from the Obama administration, continues the cycle of indebtedness and state repression. 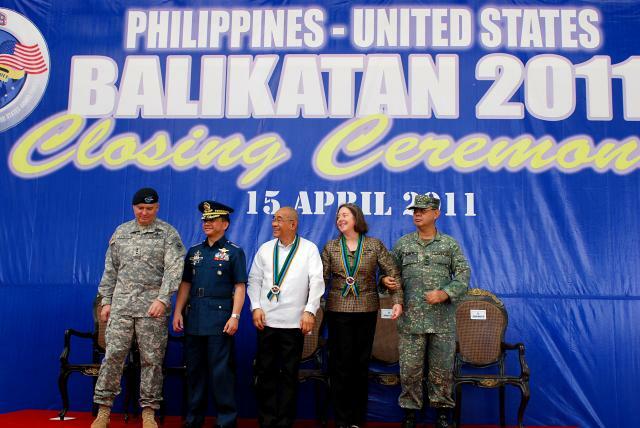 The U.S. granted approximately $28 million in military aid to the Philippines this year. This package includes financing, educating and training, and anti-terrorism schemes for the AFP, internationally notorious for over a thousand cases of torture, abductions, extra-judicial killings, illegal arrests, and other human rights atrocities within the past ten years. Imperial U.S. maintains hegemony over much of the world’s resources and preserves its otherwise crumbling capitalist economy through war and occupation. At present, one can think of the developments in Libya, Iraq, Egypt and Afghanistan as its prospective hosts. In the same vein that the U.S. snatched the Philippine revolution’s victory over Spain in 1898, it is maneuvering and manipulating these territories into subservience to American products and ideals. Not surprisingly, the model of “defend, educate, rebuild, protect” that was successfully prototyped in the Philippines is now being used in these areas of imperialist interest. To start off, the U.S. will help a country defend its people from a dictatorship by supporting the overthrow of an unpopular leader via “humanitarian intervention”. It then proceeds to “educate” the people into glorifying the U.S., mighty liberator and ally, as the state’s government and economy are revitalized by funds lent by the IMF-World Bank, rendering the weakened nation unwittingly buried in foreign debt. The local ruling class forge policies with the neo-colonizers to protect imperialist investments and promote colonial culture at the hands of a fascist government. 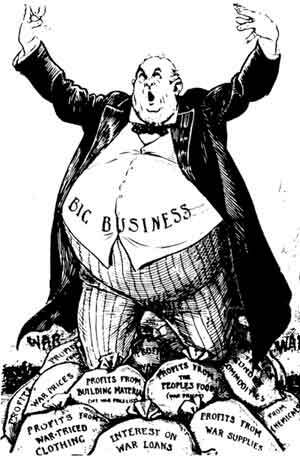 U.S. taxpayers should not subsidize the greed and ambition of monopoly capitalism. Instead, the trillions of dollars spent on war should be cut, and re-channeled as budget for social services like education, health care, housing, pension, etc. Building an anti-imperialist united front here in America is only possible if its citizens consciously link their domestic struggles to the global struggle against the reckless use of public resources for tyranny of one state over another. 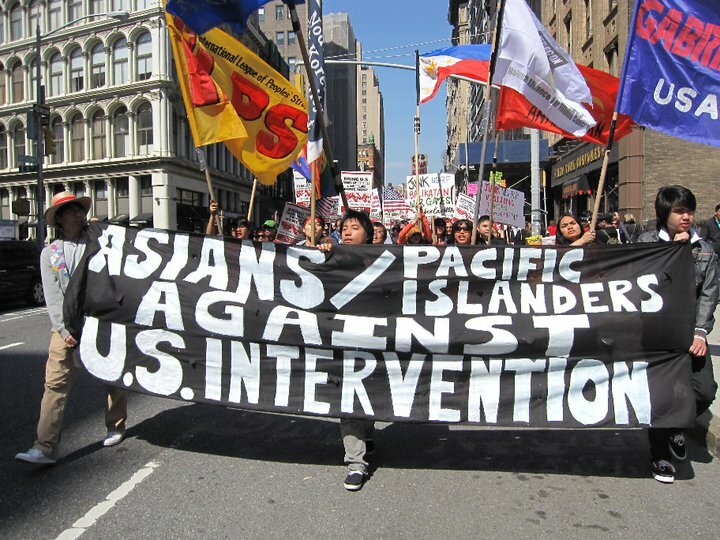 Anakbayan New Jersey is inviting the youth, Filipino and non-Filipino, to: (1) work on joint campaigns to expose and oppose U.S. military presence and military aid in the Philippines and other semi-colonial countries; (2) participate in, and launch actions for, Philippine Solidarity Week in February; and (3) join the International League of Peoples’ Struggle.